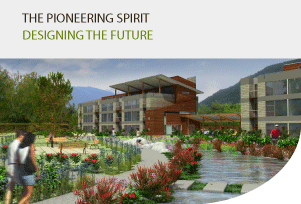 Inspired by the cone of a majestic British Columbia coniferous tree, which germinates from a seed into a giant, the identity for Chandra Krishnan Kitsault represents the spirit of limitless possibility that serves as the very foundation of the community's revitalization. For more information on our town, feel free to download our information pamphlet or book (both PDFs). The book can also be accessed in flip-book format (SWF). If unable to open the flip-book or pamphlet, Click here to download Adobe Reader or Click here to download Adobe Shockwave.